A very versatile mixer to stock any bar. Use in small doses instead of having to make your own simple syrup - it's a time saver! A versatile way to upgrade your cocktails. 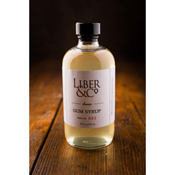 Long a staple in the world's best cocktail bars, gum syrup is a simple syrup combined with gum arabic, an all-natural emulsifier derived from African Acacia trees. The addition of gum arabic lends the syrup a silky and more luxuriant mouthfeel when compared to a common simple syrup. It is a superior sweetener with incredible versatility. 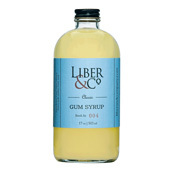 This classic gum syrup from Austin-based Liber & Company is a rich 2:1 simple syrup, meaning a little goes a long way. 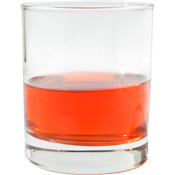 Great in aromatic, spirit-forward cocktails like an Old Fashioned or Sazerac. Formed by three native Texans, Liber & Co thrives on the notion of customers using their premium quality cocktail mixers to create unique expressions of themselves and their tastes, shaking up concoctions that are entirely new. Liber, meaning "the free one," was the Roman god of fine drinks and good times, and the brand name reflects trio Robert Higginbotham, Adam Higginbotham, and Chris Harrison's mutual love of food and beverage. Seeing that microbrews and wines had appreciated the adult beverage limelight, but finding a derth of cocktail mixers that began with thoughtfully sourced raw fruits and vegetables (versus high fructose corn syrup), Liber & Co.'s founders decided in 2011 to fill the void. Today, Liber equips home bartenders with the cocktail mixers they need to replicate drinks at the best bars in the world. 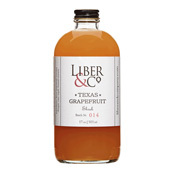 The Savory Pantry proudly stocks Liber & Co.'s Spiced Tonic, Fiery Ginger, Tropical Passion Fruit, Classic Gum, and Almond Orgeat Syrups, as well as their Texas Grapefruit Shrub. Read more about their story on our Taste.Savor.Share Blog, and see our blog archives to serve The Savory Pantry's Fiery Rasperback Cocktail (featuring their Fiery Ginger Syrup). Any way you pour it, Liber & Co brings incredible, original taste to your glass! To learn more about Liber, visit our Taste.Savor.Share Blog.